A new breed of art exhibition will open in London next month, bringing to life the legacy of one of the most popular shows of all time. 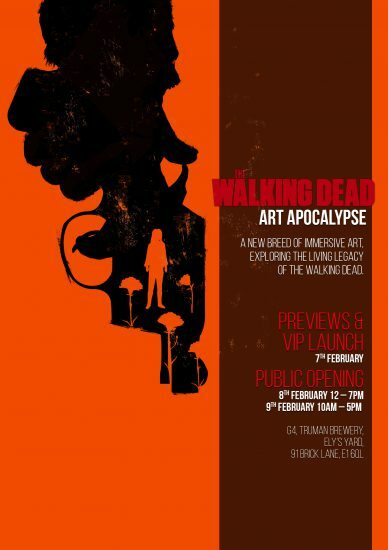 Opening on February 8th, FOX’s The Walking Dead: Art Apocalypse will give fans a unique chance to experience interactive set and prop replicas, prize-winning fan art and immersive artwork not for the faint of heart. It has been eight years since the cult series kicked off in October 2010, with more memorable and shocking moments than you can shake a blood-stained baseball bat at providing a wealth of inspiration for Art Apocalypse. Interactive displays will include a recreation of the infamous room inhabited by The Governor (David Morrissey) where gore-lovers can submerge their own head into the display among decapitated walkers, a replica of the motorbike ridden by Daryl (Norman Reedus) and live walkers recreating favourite scenes including the escape from Terminus, Winslow and the most gut-wrenching walker kills. The free exhibition also houses the twenty shortlisted entries of a national fan art competition launched by FOX in October 2018, which have been selected from over 800 entries and brought to life in the gallery. The judging panel included The Walking Dead’s very own Greg Nicotero, Executive Producer, Director and Special FX Make-Up Designer. 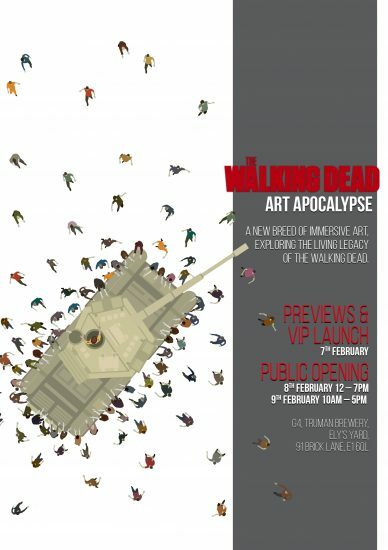 The Walking Dead: Art Apocalypse will also feature daily SFX and prosthetics displays, deconstructing the incredible make-up process that has characterised the visual identity of the show. Here, horror fans can see how the iconic walker look is created in painstaking detail over three hours, as well as the chance for visitors to experience their own walker ‘make-under’. There will also be key behind the scenes shots from filming over the last eight years, showing the cast and crew bringing the world of The Walking Dead to life. The gallery will be at a pop up space in Truman Brewery in East London, and will open its doors to fans for a limited run on Friday 8th February 12 – 7pm and Saturday 9th February 10am – 5pm. Entry is free. 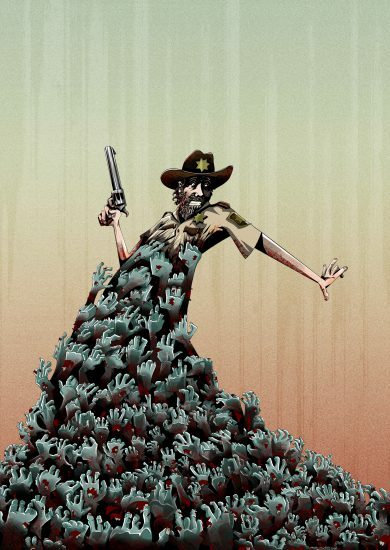 The Walking Dead fans attend a ‘death drawing’ class with a gory walker to announce fan art competition. This unique class in North London featured a female model in full body walker prosthetics and SFX, posing for a group of passionate artists and The Walking Dead fans alike, to prepare for the competition. Sorry if i sound thick but is this free to attend ??? You’re not being thick, I think it was missed out from the article, but it its indeed free, on a queuing basis. I will update.